As for all our lintels, each designation (eg. 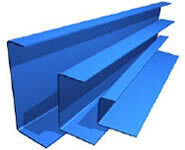 'SL7') is available in a range of widths to suit different thickness walls, but they all have the SAME load capacity. Simply suffix the lintel with your wall, eg: SL7-100. View the PDF files for details. 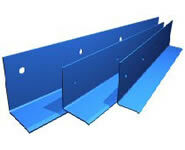 they can be used for thick single wall applications! Standard design cavity wall lintels, with fitted CFC-free polystyrene insulation and stainless steel plaster key on the underside. They are easy to install and suitable for short and moderate spans where the load ratios are not unusual. 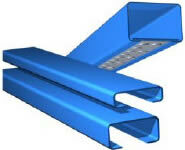 For similar applications to the SL lintels, but can carry heavier loads and handle longer spans. Care must be taken to prop the lintels correctly during construction, and restrain the wall above, unless loads are light. These lintels bolt back to a frame or masonry behind, providing a simple masonry support solution. 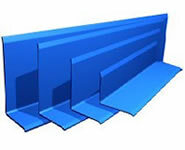 If you need to cross a cavity as well, take a look at our dedicated range of outer leaf lintels, on the product contents link listing above left. A unique range of little lintels, far lighter than concrete (and hollow for routing of services) and far tougher than wood. 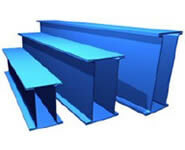 They also carry more than our competitors 'W' shape lintels. The SB7 is exactly the height of a brick! These standard box lintels are strong and easy to install. They can also be supplied with plaster key on the sides for dry lining. Their simple construction can be stretched to almost any wall dimension you need!